Fresh vegetables? Delicious herbs? Homemade broth? That’s this homemade ramen. NOTE: This recipe uses packaged ramen noodles with a quick and tasty homemade broth + fresh veggies. In case you are looking for homemade noodles, here is a great (although much more time consuming) recipe for ramen noodles made from scratch. Truth: I went to an adorbale Japanese bistro last weekend. Truth: I didn’t have time to go out to an Asian grocery store to get the fresh udon noodles and the other special non-small-grocery-store ingredients to make everything authentically and appropriately. If today is your day for an authentic Japanese cooking adventure, Nami’s amazing blog Just One Cookbook has got you covered. For me, that was not this day. Truth: this day was more I’m stressed out and I’m short on time and I just drove my car into a mountain of snow and had to be shoveled out by neighbors before even making it out onto the road. And my ecookbook recipe ingredient list just keeps getting longer and I can’t stop adding cilantro to things. And the sun is avoiding me and my photos. And I’m avoiding the gym indefinitely. And I’m still coughing. And the clothes I washed a dried a few days ago are still, um, in the dryer. WHY. This is not the day that I’m going to make it across town to the Asian grocery store. I just… noodles. Give me the noodles. I know. Be amazed at my miiiind. My goal with this post was originally to be udon-authentic, but the end resulted leaned more in the direction of practical, sort of healthy, and fresh-ly delicious in the least amount of time possible. And that’s life. Truth: There is a time and a place for a big warm pot o’ ramen noodles, complete with ramen seasoning packet. For me, that would be circa 2005 in a small dorm room with millions of Christmas lights hanging up for no reason whatsoever, three girls sitting around talking about this new college kid website called The Face-Book, and nothing but a half gallon of milk in the mini fridge. But that was a long time ago and now I’m adultish and I have a food blog thing. And anyways, when you can make your own yummy stock in 20 minutes? And it’s homemade? And delicate and light and full of mouth-loving flavor? That is the way to do it, says Adult Me. Truth: I still used chicken broth for the homemade stock. Man, the shortcuts just keep coming. Don’t even listen to me. Simmering some garlic, ginger, and dried mushrooms with your chicken broth makes for a great quickie “stock”. A good while in the pot will get some nice flavors going soon to be soaked up by those noodles. And by good while, I mean 19 minutes, because the whole thing takes 20. Truth: I dislike when bloggers use the word rambling to describe themselves. BUT I AM DOING THAT. It’s late. I’ve had another long day (parent teacher conferences – they get me every time) and here I am writing this absurd post about what I eat when I’m being regular. Truth: at the end of the day, bright veggies + flavorful broth + golden panko crumbs + chewy noodles in a bowl eaten at your own table in your own house with your own regular people is the best way. Quick Homemade Ramen – comes to life with fresh vegetables and herbs in just in 20 minutes! Heat the sesame oil in a large skillet over medium low heat. Add the garlic and ginger; stir fry for 2 minutes or until soft and fragrant. Add the broth and the water. 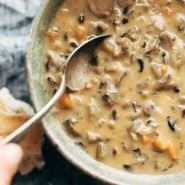 Bring to a simmer; add the mushrooms and simmer for 10 minutes or until the mushrooms have softened and the broth is flavorful. Add the instant noodles to the hot liquid and simmer for an additional 5 minutes or until the noodles have softened. Add the scallions and stir to combine. Remove from heat, stir in the kale and carrots, and top with crunchy panko crumbs (see notes) and hot sauce to taste. To make crunchy golden panko crumbs, heat a few tablespoons of oil in a large skillet over medium heat. Add the panko, stir for one minute or less, or until golden brown. Remove and place on paper towels to drain. You can also toss the panko with a little oil and toast them in the oven to get them golden and crispy. This sounds awesome! I made a ginger-soy soba noodle soup the other weekend and am trying to cook more Asian food at home, especially noodle dishes! I love how you introduced a quick (and healthy) ramen by adding lots of veggies and NOT using the packaged seasoning! It’s a bowl of comfort food that we can easily make at home. Your beautiful and delicious pictures make us want to cook ramen right away! p.s. I think what you had at the restaurant is Nabeyaki Udon – when shrimp tempura is on top, either reg. tempura udon or nabeyaki udon. Whatever it was, it was so so delicious. If you ever come to Minnesota I’ll have to take you to this restaurant to get your expert opinion. 🙂 Hope your travels are going well! Saw some of your pics – looks awesome! Oh my goodness. I just have to make this. I love all the shortcuts, sometimes we need them to be able to eat pretty good most of the time. Truth: I NEVER had ramen or those noodles!! Am I weird? I am French ahah! I definetely want to try though! I have to, don’t I? Your posts are frickin hilarious! And that ramen looks sooooooo delicious. I was busy baking all night and all I had for dinner was half a piece of chicken and a beer (lol yes I still eat like I’m in college, I really need to stop that), so I’m totally drooling over those pictures and wishing I made something like that for dinner instead! College! Ramen! It’s meant to be! Yum! You cannot go wrong with noodles, one of the best comfort foods in the world. What a great idea! I love anything with shortcuts in it that don’t really take anything (or at least much!) away from the taste and health-factor of the dish. Nami’s Just One Cookbook is great – so is Rasa Malaysia – another great blog for Asian recipes! Looking forward to your udon noodle recipe as well on another, hopefully less crazy, day! Love udon noodles!! Yes, I’m dying to try making it. It was so so good. Love your posts, your style, your honesty and now, my son Aidan will be so pleased as he is a Ramen junkie. Oh, scratch that, I will be “screwing up” his ramen by adding all those yucky veggies. Gonna try (am always trying) to convert him… sigh… would that laundry would up and fold itself when dry. Seriously. There are other things way more interesting to do in life, dontcha think? We always try to keep some ramen just in case we don’t have anything for dinner. I would much rather have this homemade version! : ) Thanks for the recipe! Pinning! I love seeing other people that are obsessive about adding/changing all food:) My husband laughs at my inability to follow a recipe or my need to add to box mac n cheese for my kids. this is a safe zone for laundry neglecters. i’m obsessed with this recipe. how come i’ve never made homemade ramen????? Saw this this afternoon. Made this this evening. YUM. I’m glad I read the comments before making it, totally added a couple eggs and some miso and it was awesome. Also finished it off with a touch of sriracha. Thanks for sharing! I’ve just discovered your blog searching for ramen recipes on Pinterest… and I’ve made your version of it, it’s delicious!! I just added small chunks of chicken at the same time as the noodles. Hang in there Lindsay!!!!!!! You are SO close to the finish line on your eCookbook!! It probably feels like a big heavy weight sitting on your shoulders, but you are almost almost almost there! 🙂 And honestly? I’d much rather have a big bowl of your 20 minute noodles than the fancy Japanese bistro ones. I can never pronounce (or recognize) the names of half of the ingredients… And with how quickly your yummy dish comes together, it’d be the perfect dinner for me! Aw, you’re sweet! Thanks Amy!! Grown up ramen! Love it! All of the wonderful memories of our youth with sophisticated taste. Great recipe! I am not a fan of ramen, but yours looks really yummy! I get rare cravings for them once in a blue moon. The next time I get a random rare craving, I gotta try your version. I do, however, love udon noodles. I can imagine how yummy udon version would be. Awesome! i made this Saturday for lunch and thought it was great, even better the next day (I think the flavors just got to meld longer. I used spinach and dried portabellas and no carrots, and didn’t make the panko topping and it was still great! Thanks, i’m a big ramen eater (with the seasoning packet) so this was really a nice change and I didn’t feel bad after eating it! I will definitely make this again. This is fabulous – I hadn’t thought there was an easy way to make instant Ramen taste so good. I didn’t have everything to hand (kale, mushrooms) but it was an ideal lunch. I’ll never use the powder packets again! Made this for last night’s dinner. I didn’t have Kale on hand, so used Baby Spinach. Soooooooo good! : ) Thank you for a fabulous recipe!